Since my younger days, whenever the subject of fine swords has cropped up, I have immediately thought of Masamune. In other words, Masamune swords are so famous, even children know about them. Masamune is the name of the master swordsmith who made them. 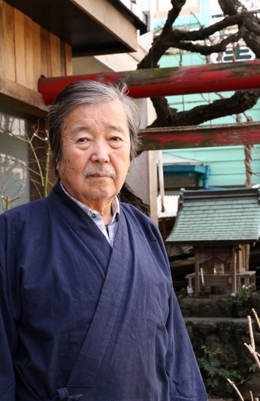 In recent years my work has increasingly brought me into contact with Japanese culture, and recently I had the opportunity to meet Tsunahiro Yamamura (Masamune XXIV), a master swordsmith in Kamakura who is carrying on a 700-year-old sword-making tradition. All of a sudden, a very simple question occurred to me: Why indeed are Masamune swords so splendid? After reading various materials and talking with Mr. Yamamura, I realized that the world of Japanese swords is extremely abstruse, and a layman like me could not possibly answer this puzzle. So please read the following not as a correct answer to the question but just as one theory of mine, taking account of the fact that I am quite ignorant about sword making and also the difficulty of speculating about the enigmatic lives of the swordsmiths, whose dates of birth and death are often unknown. Broadly speaking, the history of Japanese swords can be divided into four eras. It was in the late Heian period (794–1185) that Japanese swords began to be made; until then, the making of straight swords, without any curvature, had been transmitted over the sea to Japan from China and Korea. The Japanese swords made from the end of the Heian period through the Sengoku period (1467–1590) are known as koto (old swords), and those made from then until 1876, when the Meiji government issued a decree banning the wearing of swords, as shinto (new swords). Japanese swords made since then are called gendaito (modern swords). In the old-sword era, sword making was limited to certain districts. The main production areas were Yamato (present-day Nara area), Yamashiro (Kyoto), Bizen (Okayama), Soshu (Kamakura), and Mino (Gifu). Each of these five districts had distinctive styles known as the Yamato School, Yamashiro School, Bizen School, Soshu School, and Mino School. 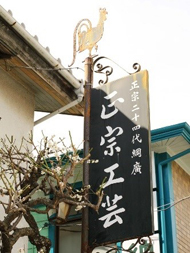 Together they are called the “five traditional schools of sword making” (gokaden). It is said that in order to improve the sword-making skills of local blacksmiths, Hojo Tokiyori (1227–63), the fifth shogunal regent of the Kamakura shogunate, invited well-known swordsmiths to Kamakura, including the likes of Awataguchi Kunitsuna from Yamashiro and Bizensaburo Kunimune from Bizen. Shintogo Kunimitsu, who is known as the father of the Soshu School, studied under these famous swordsmiths. Kunimitsu’s aim was probably to learn and develop the sword-making techniques of the Yamashiro and Bizen schools and thereby establish a style (the Soshu School) unique to Kamakura, the home of the shogunate at that time. One of his pupils, Tosaburo Yukimitsu, carried on Kunimitsu’s will, and eventually, it is thought, the Soshu technique was perfected by Yukimitsu’s son, Goro Nyudo (Masamune). The characteristics of the Soshu School were the fine texture of the sword and its large hamon (blade pattern), achieved by mixing hard and soft metal and firing at a high temperature. When compared with swords made until then, Soshu swords did indeed look much more splendid and beautiful. In the Kamakura period (1185–1333), when Masamune was alive, Japan faced two national crises in the form of the attempted Mongol invasions of 1274 and 1281. School textbooks taught us that Japan was saved from these Mongol invasions by kamikaze (torrential rainstorms and typhoons; literally, “divine winds”). But in the process of investigating Kamakura sword making, I discovered that the story described by materials about the Mongol empire’s attempted invasions was quite different from what I had imagined. According to the materials that I read, in both 1274 and 1281, samurai of the Kamakura period put up an extremely courageous fight and warded off the invading Mongol army. In the first invasion, the Japanese were baffled by the strategy of the Mongol army of attacking not man-to-man but in groups and its use of arrows daubed with poison and weapons using gunpowder that they had never seen before. In particular, unlike Japanese armor, Mongol armor was made of leather, which was difficult to slash with Japanese swords of the time. Nevertheless, despite suffering huge casualties, the samurai defending Kyushu managed to repel the invaders. Kazuhiro Motegi, a pupil of Mr. Yamamura, forges a mixture of hard and soft steel. 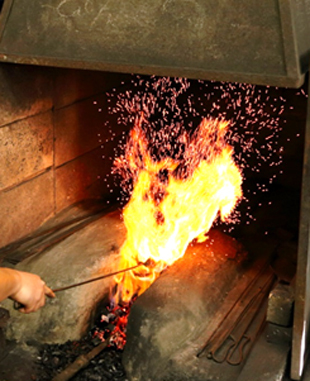 The most important process in the sword-making technique of the Soshu School, which was perfected by Masamune, is yakiire1 (quenching), when the sword is fired at a high temperature and then rapidly cooled. Usually, given the general properties of steel, this process tended to make swords difficult to curve and easily breakable. But by repeatedly trying out firing methods at high temperatures and cooling methods at different water temperatures, Masamune seems to have discovered the best way to make sharp and resilient swords. In addition, the Soshu School used a previously unknown combination of hard and soft steel to produce a strong and tenacious metal suited to its method of quenching. 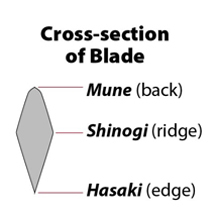 The swords of Masamune I are said to have been long, with slight sori2 (curvature), appropriate mihaba3 (width), thin kasane4 (thickness of the back of the sword), high shinogi5 (ridge), no hiraniku6 (flat blade sides), long kissaki7 (blade point), scarce fukura8 (cutting edge), and many jinie9 (surface particles). The long swords would have been necessary in fighting the Mongols at sea; the curvature and width were likely connected to the strength of the swords; and the thinness, high ridge, flat blade sides, and long and sharp points no doubt made it easier to slash the leather armor of the Mongol troops. Masamune is said to have had many pupils, including swordsmiths not only in Kamakura but also in Yamashiro, Bizen, and Mino. Although one wonders whether they really were all Masamune’s pupils, it does appear that in a world of sword making in which trade secrets were passed only from father to son, Masamune transmitted techniques to other schools as well. If his aim in doing so was to defeat a foreign enemy, then I am probably not the only one who senses some humanity and romance in his deeds. 1. After forging tempered metal into the shape of a sword, the whole sword is fired at a high temperature and then cooled in a water tank to harden it. 2. Unlike straight swords, Japanese swords are curved. The meaning here is that the Masamune swords had slight curvature. 3. The width of the blade. 4. Thickness seen from the back of the sword. 5. The ridge running along the side of the sword between the back and the edge. A line is visible from the side. 6. The metal part from the edge to the ridge is flat (literally, meatless). 7. The sharp, pointed tip of the sword. 8. The curved part of the blade point. “Scarce fukura” means that this part is almost straight with no curve. 9. Martensite, the main component of quenched steel, has particles (called nie in Japanese) that are visible to the naked eye. They appear not only on the blade pattern but also on the curved surface of the sword. Masamune swords have many martensite particles. This sword was made by Masamune VI, who lived in the later sixteenth century. You can see nie particles on the bottom of the blade pattern. Why Are Masamune Swords So Splendid? The swords of the Soshu School, which were perfected by Masamune, use a mixture of hard and soft steel and are made by firing at a high temperature and then rapid cooling. As a result of this process, they are beautiful swords with deep nie particles and large blade patterns. It is said that such great historical figures who played a significant role in unifying the nation as Ashikaga Yoshimitsu (1358–1408) in the Muromachi period, Toyotomi Hideyoshi (1537–98) in the Azuchi-Momoyama period, and Tokugawa Ieyasu (1543–1616) in the Edo period loved Masamune swords, no doubt because of their beauty and elegance. Such leaders apparently presented Masamune swords to their subordinates in gratitude for distinguished services. I imagine that this background is the reason why the obvious beauty of Masamune swords is emphasized so much. By reading various related materials, however, and learning about the development of the Soshu School almost in sync with the background of the Mongol invasions, which represented the biggest national crises in the history of Japan, I could not help thinking what a miracle it had been that Masamune, fearing another national crisis, had so earnestly set about honing his skills and perfecting the Kamakura sword-making technique. When I spoke with Mr. Yamamura (Masamune XXIV), he told me that the metal of the swords made by Masamune I appeared to be a purplish black, and the blade pattern was a beautiful glittering silver. “However hard we try,” he said, “we cannot reproduce that color. They must have used a different kind of steel then.” As he harked back over 700 years, the look of a genuine swordsmith on Mr. Yamamura’s face was most impressive.